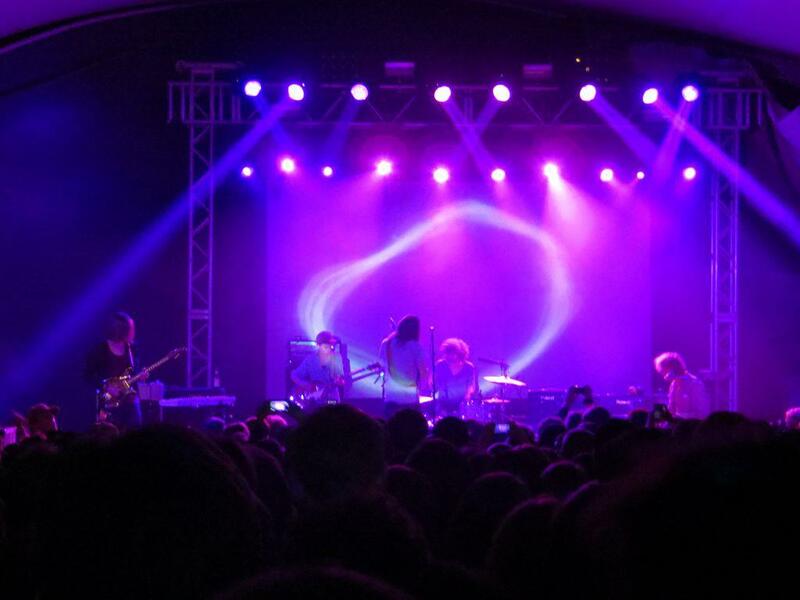 So I recovered from both The Hives and the bachelor party enough to make it out to Stubb’s to see some sweet psychedelic music from Tame Impala. It was a tasty evening at Stubb’s even though I didn’t have any BBQ (a first for me there). The opening act, The Growl, was even an unexpected surprise. Although I’m still digesting them. Yeah no food at Stubb’s. Nothing much to talk about for the venue. If you haven’t been, you should treat yourself at least once to the venue. It’s odd shaped and produces some decent on the fly BBQ. The best spot is right in front of the soundboard, maybe off to the left where the tree grows. The Growl came up first. I did not know what to expect. I half thought it was some kind of grungy version of the psychedelic music Tame Impala jams. Boy oh boy, I was wrong. It was a much of some slow, rusty, drone type rock with a couple of blues songs (even a cover) tossed in. I’m not sure how I feel. It was different, but I can’t really recall any songs from their set. I just remember the cool blues cover they did. Tame Impala was next. When you think of psychedelic music, you think of crazy, lava lamp like visuals with a pulsing guitar rhythm and some softly voiced dude murmuring over it. That’s what I got. And I loved every second of it. It was an almost religious experience out there. There were a couple of breaks in the action, though. A good indicator of how well a psychedelic band performs is in their long, solo jams. Tame Impala had them, but it just didn’t quite hit with me. It seems like they are still finding their solo voice. Just take a listen to Elephant. They slow it down and kind of fiddle around but it doesn’t exactly hit. I have great confidence that with time, they will make it flow better. It’s still and acceptable platform of rock. So The Growl is like a fiber in my belly that leaves a taste that I’m still trying to figure out. Tame Impala has some spicy burnt ends but the middle still seems rough. All in all, it was a great meal to feast on at Stubb’s. I just wish they had some ear-bibs at the front gate to catch the noise dribble’s. That’s a thing, right? Ear-bibs?